The humerus connects the shoulder and the elbow. It is a S-shaped bone with a twist. It is made up of a top portion (metaphysis) connecting to the shoulder blade (Scapula), it has a long thick shaft in the middle and is attached to the elbow via the condyle. 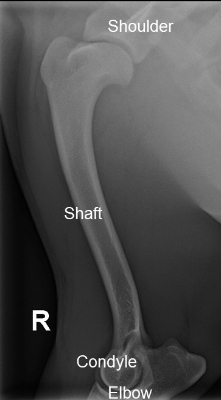 Humeral fractures account for ~10% of fractures in dogs and 5% to 13% of fractures in cats. Most humeral fractures involve the middle and distal one third of the bone. Shaft (diaphyseal) humeral fractures are caused by high energy trauma - motor vehicle accidents, gunshots, and falls. Casting is not appropriate for humeral fractures due to the difficulty in effectively immobilising the joints above and below. The humerus lends itself to surgical repair via a multitude of options including external skeletal fixation, intramedullary pinning with lag screws or cerclage wiring, plating with or without intramedullary pinning and inter-locking nails. Plates, screws and pins are most commonly employed in repair. Fractures of the humeral condyle involve the joint. This means that perfect anatomic repair must take place to prevent long term pain and arthritis. Some degree of arthritis is inevitable with humeral fractures but this can be minimised with excellent reduction and secure fixation. 2 types of fractures can affect the condyle - a uni-condylar fracture (just one side involved) or bi-condylar (both sides). Our surgeons have extensive experience with both forms, having lectured on the topic nationally and internationally. Bi-condyle repair is performed with 2 adjacent bone plates and multiple screws. Typically very good. Most animals are expected to return to normal function once they have completed their recovery. A 6 week rest period is mandatory after surgery. Careful rest after fracture surgery is the key to success. Patients will remain hospitalised for between 1-2 days post operatively depending on comfort, mobility and temperament. Once they are ready for home management, a dedicated rehabilitation and activity plan will be put in place. 6 weeks after surgery for additional assessment and follow-up radiographs to assess rate of healing. This check is very important to guide further activity, a return to normal activity is sometimes possible at this time. Whislt every effort is put in place to prevent complications, they do happen infrequently. Potential complications include infection, mal-union (healing inappropriately), non union (not healing), implant breakage or loosening causing lameness, onging lameness and nerve damage.